I started my year with a Korean Cosmetics Haul from Beauty Credit (seen in this post) and this Lovely Q10 Make Up Base is one of the best purchases I got there. 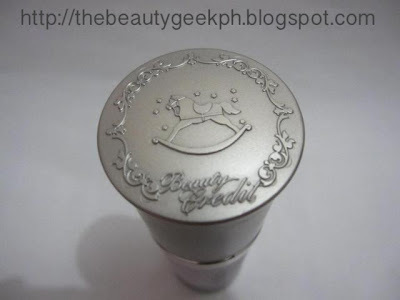 I've been using it for almost a month now and I think it deserves a review..
Beauty Credit is a Korean skincare and cosmetics brand that is developed by Somang since 2004. It has almost 180 outlets around the world including major cities like New York, L.A. and etc. As much as I want to say what the product really says, I cannot, because it is written in Korean. Sorry girls! Been trying to search the site for an english translation on the ingredients and I couldn't seem to find one. Will update it if ever I get to that! 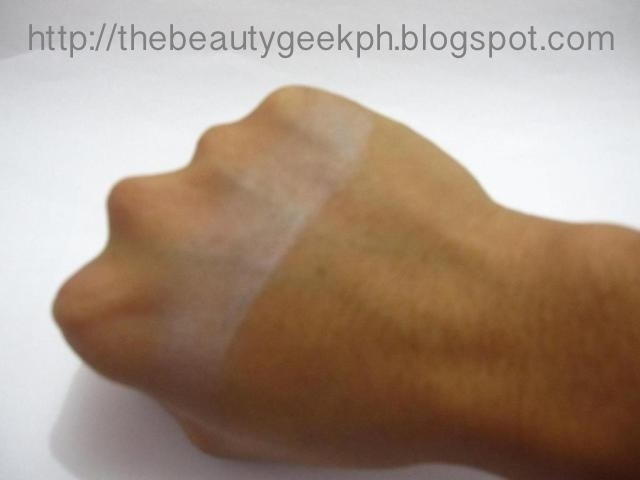 This product is a Matte base with SPF 18. It came in two shades: Green and Purple. I have with me the latter. 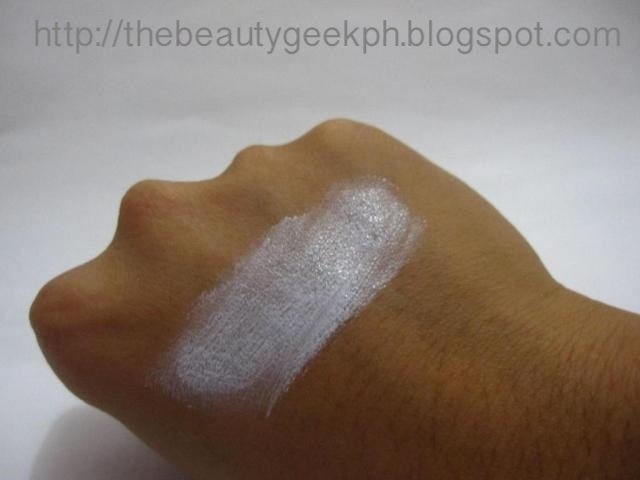 Colored bases are used to neutralize the flaws that our skin have before continuing with foundation. Let's go back to the color wheel that we were thought during pre-school. We have to remember what comes opposite at color wheel to help us remember how to neutralize colors. For instance you see three concealer shades in Green, Purple and Orange. Green will be used to neutralize any redness, Purple is used to brighten yellow undertones, and Orange - the opposite of Blue in the color wheel will be good for under eye circles. It also came in two types which is matte and moist. I chose matte because I have combination skin. 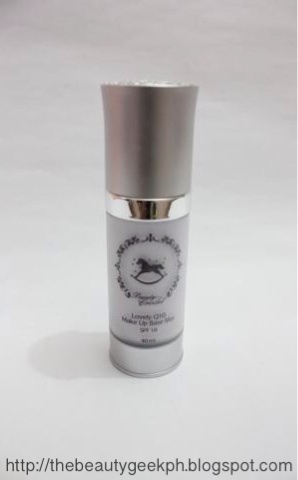 Aside from having SPF, this make up base has Q10 - a coenzyme (ubiquinone) which is a cutaeneous anti-oxidant. Q10 is present in our cells and helps provide energy for cells to regenerate. However, as one ages, this coenzyme depletes as well. Since Q10 is an antioxidant, free radicals become neutralized. The skin is our first defense in our body. Just think about the many external factors that could contribute negative effects in our skin like too much exposure to the sun - these are considered as free radicals that may damage our skin. But, for it to regenerate, we need the coenzyme Q10 to help it repair. 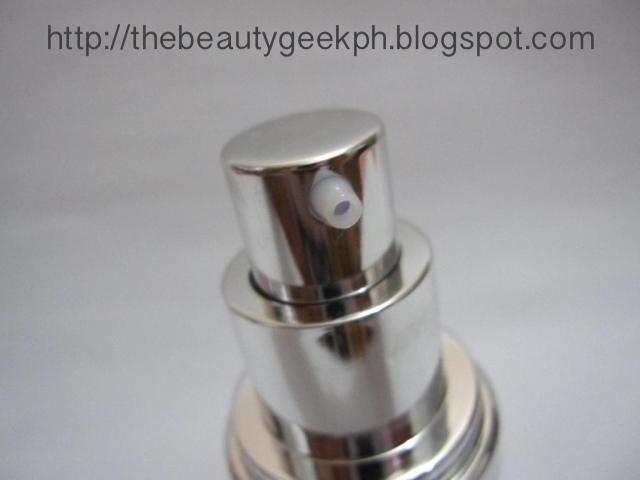 A lot of cosmetics and skincare use the advancement of science to help improve their products. Suffice it to say, aside from this product being a make up base alone, it also has properties that help skin improve while using it. Creating a flawless canvass and repairing your skin - that's hitting two birds in one stone. I love the emblem! Very chic packaging! PRICE: Originally costs P400 ($10.00) but I bought it for P200 ($5.00) only! AVAILABILTIY: I bought this from a trip to Subic but, it is also available at SM Mall of Asia and SM Cubao Department Stores. Comes in a pump bottle! Very hygienic! 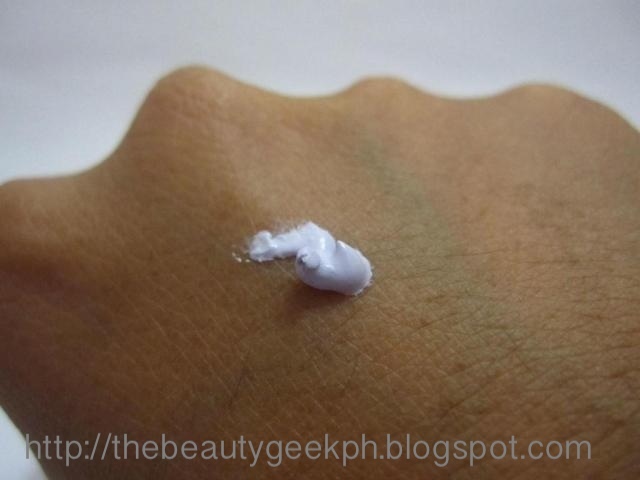 It leaves a white cast on the face because of the spf. Not easily available. Only select Watsons outlet have it. If you are sensitive with scents this may not be good for you as it has a slight musk scent. 'Matte' wasn't spelled correctly,but a lot of Korean cosmetics have that glitch anyway. Ooops! I pumped too much! A little goes a long way. Packaging! I really love the packaging especially the embossed rocking horse on the cap. It looks very classy. A little goes a long way. You just need a pea sized (sometimes even smaller) amount to cover your whole face. It gives out a matte finish and makes my make up last longer. My face usually gets oily around 4 hours when I have make up on, but when I am using this, it stays matte for up to 8 hours. It helps even out discolorations in my face and brightens it up as well. I posted swatches of the product below. Consider yourself warned! 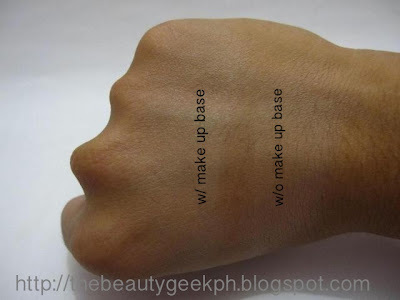 I used the back of my hand for swatches. You may notice that it is lighter for my tone. I had been playing under the sun for the whole month which is why I am sun kissed or rather sun burnt all over. If you fear that it might give you espasol face (the kind where you wear too light foundation) all you have to do is pick a foundation that is a notch darker than your skin tone. cover for this one. Its better to use a darker shade of foundation though. Ohh, it looks nice with the foundation. Seems like it blends out better! Thanks for dropping by Mrs Gaeul! I am desperate to try some Korean make up, everyone seems to have some except me :( I have never seen purple base before, maybe it's quite common and I just never noticed though, great post. i came by after seeing you had joined the GIG group, you will love it, everyone is so nice and friendly. i will follow you now on bloglovin and GFC, would love for you to check out my blog too hon. BTW matte can be spelt matt or matte in England, both are acceptable, so maybe they are using English spelling and not American?? ?